Since 2008, Upline Moving has provided award-winning moving services customized to suit each customers' needs. Sunnyvale is part of Silicon Valley and is home to all kinds of workers ranging from Lockheed Martin’s rocket scientists to Google’s interns. If a new opportunity is drawing you away from Sunnyvale, or if you’re trading up to a bigger apartment in town, you’ll need the services of trusted Sunnyvale movers. When you’re planning an in-town move, you might think you don’t need help—but that would be a mistake. Why go through the hassle of packing, hauling, and all the other moving-related tasks when our affordable services allow you to take care of it all with just one phone call? Whether you’re moving from a small apartment or the biggest home in town, our residential movers will make light work of your local move. A long distance move can seem an overwhelming task, but our experienced movers will handle all the moving-day details. You have to trust your long-distance mover with all the things you love most from your favorite piece of fine art to your family photos. Our highly skilled team has moved nearly 200,000 items, and we’ve handled every one of them as carefully as we would our own belongings. You’ll have peace of mind when you choose our top-rated movers. Some of our customers want to save money by doing some of the packing on their own—and we can create a custom plan that allows you to do that. 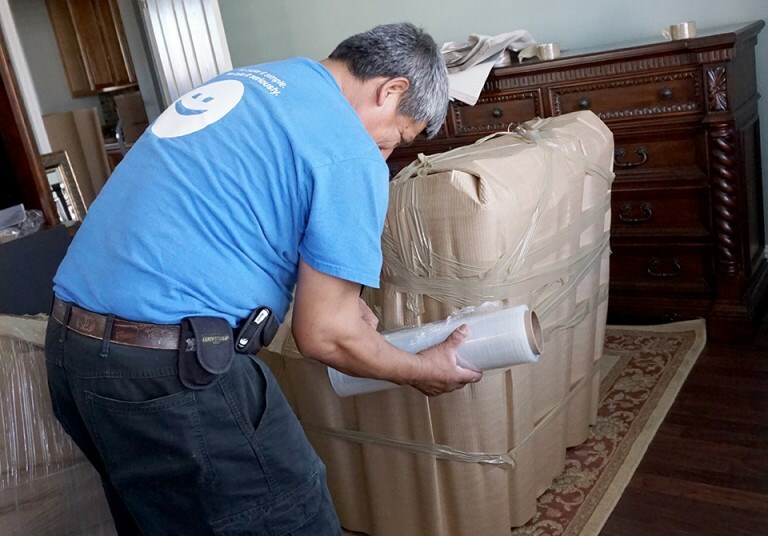 Others want to hand over every detail to our Sunnyvale residential movers. When you choose Upline Moving’s full-service moving, we can take care of everything from packing the first box to setting the last piece of furniture in place. Last Minute Move? Our Sunnyvale Movers Can Handle It! Some moves are planned months in advance—but what if don’t have the luxury of time? Our team is skilled in organizing last-minute moves, and we always keep your deadline and your budget in mind. As is the case with all of our moves, we offer 30 days of free storage, and that can be extended for long-distance relocations. If you just found out you have to move in a hurry, don’t panic—just call the team at Upline Moving. Contact our Bay Area movers today to learn more about our award-winning services and to see for yourself why we earn repeat business from 70% of our customers! Contact us to schedule your moving day and to request a no-cost, no-obligation moving quote. Call Upline Moving today or fill out our online form now to get started.